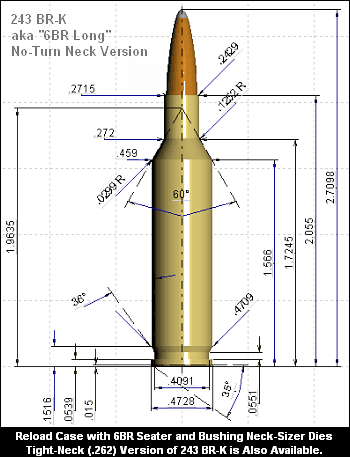 Looking at the drawing BR-K and knowing my 6mm Super X dimensions, the case capacity of the two have to be essentially the same. I make mine by using a 6XC sizing die up .120″ from its normal position in the press, but use .243 Win brass as the base brass. It is very easy to make the brass for the Super X – lube the neck/shoulder area of .243 Win brass with Imperial Sizing Die Wax – in and out of the sizing die – done! I also use a 6XC seater as well. 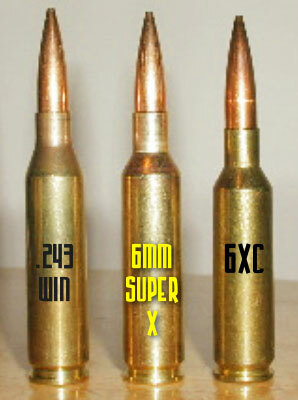 For use with the Super X, I have a .120″ spacer I put under the dies because I also use the 6XC dies for my 6XC rifle too (without the spacer of course).